Ethnobotanical leaflets 14: 427-34, 2010. Hepatitis has spread widely due to environmental pollution damaging liver cells, which need regeneration of hepatocytes and gradual replacement of the damaged cells. Since Calotropis gigantea is widely used in Ayurveda for the treatment of liver disorders, attempt was made to scientifically evaluate its hepatoprotective activity in rats. Key words:� Alcoholic extract, Calotropis gigantea, hepatoprotective, CCl4, silymarin. Calotropis gigantea R.Br. (Asclepiadaceae) is commonly known as milkweed or swallowwort. It grows about 1-5m high. The flowers are used as digestive, tonic, in cough, cold and asthma . Plant parts have been reported to have antidiarrhoeal [2,3], analgesic activity , anti-inflammatory , antipyretic  and CNS depressant activity [7,8]. It contains alkaloids, tannins, phenols and resins [9,10]. Tetra and pentacyclic triterpenoids, cardiac glycosides , flavonol glycosides  and a non protein amino acid giganticine have been reported. Its use in hepatitis has been illustrated in Indian System of Medicine . The folks and Vaidyas have clinically used it successfully. But no studies have been reported on hepatoprotective activity yet. This motivated the biological evaluation of this activity of its flowers. �������� �National Herbarium of Cultivated Plants, New Delhi, authenticated the plant parts of Calotropis gigantea, voucher no. NHCP/NBPGR/2005/89/4072. The flowers were collected in April from Bhopal (M.P.). They were dried in shade, coarsely powdered and macerated for 72 hrs. in alcohol (95%). The alcoholic extract was concentrated and suspended in vehicle (5% v/v aqueous Tween 80). This suspension of extract was used orally at a dose of 250 mg/kg for the evaluation of hepatoprotective activity by studying the biological, physical, functional and histological parameters. �������� Wistar albino rats, weighing 130-160 gm were maintained under standard conditions and diet. They had free access to water. The experiments were carried out by the permission of Institutional Animal Ethical Committee. �������� The activity was evaluated in three models. The rats were divided into four groups each containing six rats. Group I was administered 10 ml/kg b.w. of vehicle and served as control. Group II was given a dose of silymarin (100 mg/kg) and was marked as standard. Group III was administered a dose of 250 mg/kg of alcoholic extract of Calotropis gigantea flower (CGF). All the above doses were given orally. Group IV (toxicant) was administered 10 ml/kg of vehicle everyday and a single i.p. dose of 1.25 ml/kg b.w. CCl4 (in equal volume of liquid paraffin) along with other groups. Table 1 Effect of alcoholic extract of C. gigantea flower on serumenzyme activity and weight of liver in CCl4 induced liver damage (Model I). *P<0. 001 and **P<0.01 as compared to toxicant. The four groups of rats were taken as stated above. On the first day all the groups were administered their respective doses.� After 2 hrs. of dosing, all the rats were given an intraperitoneal dose of 1.25 ml/kg CCl4 (in equal volume of liquid paraffin), except the control group. On second and third day all the groups were again given their respective doses. On fourth day blood was collected and studies were done as performed during prophylactic studies. The results are presented in Table 2. 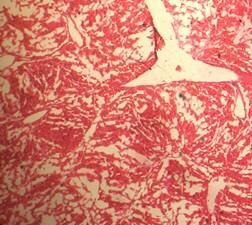 Small pieces of liver were transferred to Bouins fluid and used for histopathological studies Fig 1. Table 2� Effect of alcoholic extract of C. gigantea flowers on serum enzyme activity and weight of liver in CCl4 induced liver damage (Model II). The reduction in the sleeping time was used to evaluate the protection of rat liver against the CCl4 induced liver damage. Six groups of rats containing six rats in each group were taken as shown in table 3. On first day animals were given their respective doses. After two hours of treatment all animals were given CCl4. �On second day again all the rats were given their respective doses and one hour after treatment they were given pentobarbitone sodium (40 mg / kg i.p.). The onset of action and duration of sleep (loss of righting reflex) was noted. The results are represented in table 3. Table 3 Effect of alcoholic extract of C. gigantea flower on pentobarbitone hypnosis in CCl4 induced liver damage in rats. All values are given in Mean � SEM, *P<0. 001 as compared to toxicant. The hepatoprotective activity was adjudged from the serum parameters SGOT, SGPT, ALP and BLN. The results were further confirmed by pentobarbitone hypnosis, histopathological studies of liver sections and weight of liver of the rats. The results of the prophylactic and curative studies (model I and II) reveal the change in the biochemical parameters of the CCl4 intoxicated animals whereas no such change was observed in the control. A significant reduction in the serum parameters and liver weight was observed in the animals treated with silymarin and alcoholic extract of calotropis gigantea flowers (CGF) when compared with the toxicant, showing hepatoprotective activity. The extract was found to be more effective than the standard drug silymarin. In pentobarbitone induced sleeping time (model III), C. gigantea extract of flowers could not reduce the sleeping time as they have CNS depressant activity7,8 which synergise the pentobarbitone effect. Early onset of action and prolonged sleep was observed. However it can be inferred that C.gigantea flowers are hepatoprotective as duration of sleep was significant in both the groups treated with CGF. Histological studies reveal that the liver sections of control animals showed normal hepatic architecture whereas the toxicant group exhibited great distortion. 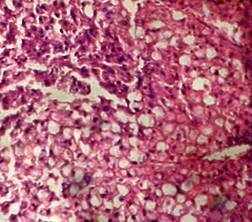 The sections of silymarin treated animals had slight distortion in the hepatic architecture with mild dilatation of central vein without congestion but the hepatocytes were normal.� The section of CGF treated animals revealed hepatocytes arranged in normal looking lobules with central vein and portal triads. The hepatocytes showed features of ballooning necrosis (early stage) with slightly granular cytoplasm and centrally placed nucleus. Fig. 1. 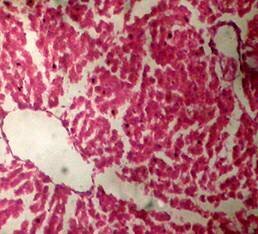 Optical microscopy of thin sections of liver of rats ( Model II ). reported that the sleeping time is prolonged with early onset of action in animals treated with barbiturates due to a decrease in its metabolism16. The standard and the extract significantly decreased the serum level of the enzymes. Although the sleeping time and the weight of liver was increased in the extract treated animals, it was less than the toxicant group. 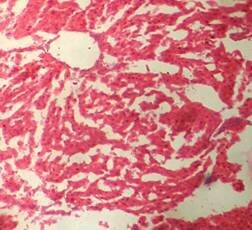 These results were further supported by the histopathological studies. The hepatic cells, intralobular veins and the endothelium were found to be damaged in the toxicant group whereas negligible damage was seen in animals treated with extract and silymarin. Thus the results of histopathological parameters support the biological, physical and functional parameters. The above studies reveal that the group of rats treated with CCl4 developed significant hepatic damage as observed from elevated level of specific enzymes, weight of liver, pentobarbitone hypnosis and histological studies. The extract treated group showed a significant protection in the serum enzyme levels. Pretreatment (prior to CCl4 intoxication) was found to be lesser effective than the post treatment by drugs. Thus we conclude that the calotropis gigantea flower extract has very good prophylactic and therapeutic effect. The authors are thankful to Dr. Neelkamal Kapoor, Professor and Head, Department of Pathophysiology, Gandhi Medical College, Bhopal. 1. Annonymous : The Wealth of India, CSIR, New Delhi, 1992, Vol. 1, pp. 78-84. 2. Argal, A. and Pathak, A.K., Indian Journal of Natural Products, Sep. 2005, 21(3), 42-44. 5. �Argal, A. and Pathak, A.K., Indian Journal of Natural Products, Dec. 2005, 21 (4), 55-57. 6. �Chitme, H.R., Chandra, R. and Kaushik, S., Phytotherapy Research, 2005, 5, 454-456. 7. �Argal, A. and Pathak, A.K., Journal of Ethnopharmacology, 2006, 6,142-145. 8. �Argal, A. and Pathak, A.K., Indian Journal of Applied Life Sciences, vol.2, June 2006,� 41-43. 9. Handa, S.S. and Kapoor, V.K., Pharmacognosy, 2nd Edn., Vallabh Prakashan, New Delhi, 1989,� p. 283. 10. Evans, W.C., Pharmacognosy, 15th Edn., W.B. Saunders, New York, 2002,� p. 471. 12. �Sen, S., Sahu, N.P. and Mahato, S.B., �Phytochemistry,� 1992, 31(8), 2919-2921. 13. Pari, K., Rao, P.J., Devakumar C. and Rastogi, J.N., Journal of Natural Products, 1998, 61, 102-104. 14. �Gopesh, B., Sudhanidhi, Vanaushdhi Ratnakar Ank, Vol.1, Dhanvantrikaryalaya, Aligarh, 1986, pp. 166-169. 15. �Jadon, A., Bhadauria, M. and Shukla, S., Indian drugs, 2005, 42 (3), 136-142. 16. Yadav, N.P. and Dixit, V.K., Journal of Ethnopharmacology, 2003, 86, 197-202. 17. �Kamat, C.D., Khandelwal, K.R., Bodhankar, S.L., Ambawade, S.D. and Mhetre, N.A., Journal of Natural Remedies, 2003, 3(2), 148-154. 18. Molander, D.W., Wroblewski, F. and La Due, J.S., Clinical Research Proceedings, 1955, 3, 20-24. 19. Zimmerman, H.J., Kodere, Y. and West, M., Journal of Laboratory and Clinical Medicine, 1965, 65, 315. 20. Drotman, R.B. and Lowhorn, G.T., Toxicological sciences, 1978, 1, 163-171. 21. Thabrew, M.I., Joice, P.D.T.M. and Rajatissa, W.A., Planta Medica, 1987, 53, 239-241. 22. Recknagael, R., Pharmacological Review, 1967, 19, 145-196.